← More things to ferment and brew…Kombucha!! 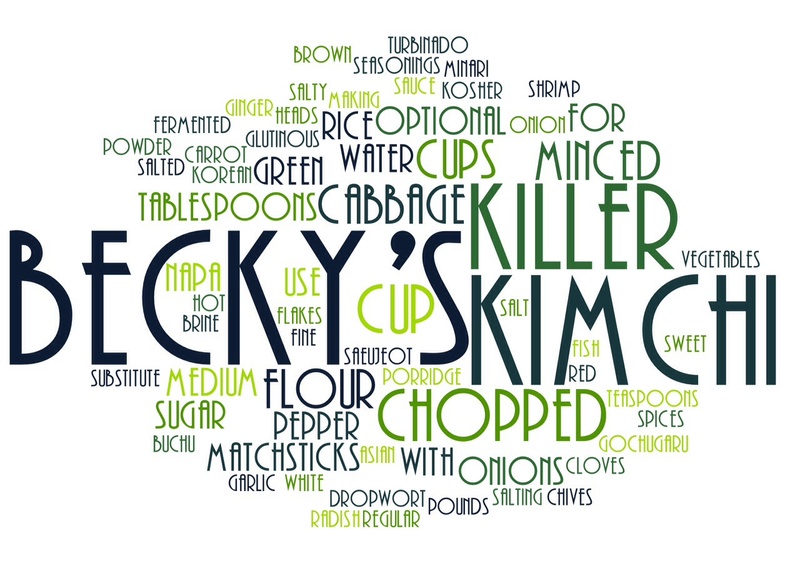 Here is the recipe for Becky’s Killer Kimchi. Let the cabbages rest for 2 hours. Turn over every 30 minutes, so they get well salted. From time to time you can ladle some of the salty water from the bottom of the basin over top of the cabbages if you want to. After 2 hours, wash the cabbage a few times under cold running water. Giving them a good washing, to remove the salt and any dirt. Place in a strainer over a basin so they can drain well. Combine the water and the sweet rice flour in a small pot. Mix well with a wooden spoon and let it cook over medium heat for about 10 minutes until it starts to bubble. Add the sugar and cook 1 more minute, stirring. Remove from the heat and let it cool off completely. Place garlic, ginger, and onion in a large mixing bowl. Add fish sauce, fermented salted shrimp, and hot pepper powder. Mix well with the wooden spoon until the mixture turns into a thin paste. Add the radish, carrot, and green onion, plus the Asian chives (or more green onions) and the water dropwort if you’re using them. Mix well. Add cooled off porridge and mix well. Spread kimchi paste on the cabbage so that it’s evenly distributed. When it is all covered with paste put into your jar or plastic container. Eat right away, or let it sit at room temperature for a few days to ferment. The kimchi will start fermenting a day or two at room temperature, depending on the temperature and humidity of your room. The warmer and more humid it is, the faster the kimchi will ferment. Once it starts to ferment it will smell and taste sour, and pressing on the top of the kimchi with a spoon will release bubbles from beneath. Once it starts to ferment, store in the refrigerator to use as needed. Storing in the fridge slows down the fermentation process, which will make the kimchi more and more sour as time goes on. Posted on December 30, 2014, in Fermenting, Homesteading In The City and tagged fermented, fermenting, kimchi, recipe. Bookmark the permalink. 4 Comments. Thanks Melissa. Happy New Year to you and your family! I grew up eating Kimchi (my father’s family is Chinese) and I have had an addiction almost my entire life. Within the last few months I introduced my husband and now he can’t go one day without it. We will admit it..yes we have a problem. I’ve never endeavored to make it…but after seeing your wife’s recipe I may just have to try this year with cabbage from the garden! Thanks for sharing the recipe!! Definitely try the recipe….it’s very easy. We just picked up some more cabbage today as we are running seriously low at the moment. Let there be soap! …Can I eat it?